1958, 50s Mad Men, Retro Office Clothing Patterns - JR. MISSES' & MISSES' CHEMISE & BLOUSED DRESS. Softly eased... two important new fashion silhouettes . (A) The Chemise Dress...with contrast trim at neck and sleeves, and belt tabs at the hipline for the new "dropped waist" look. (B) Bloused sheath with two sets of pockets. (C) Tab-detailed bodice. 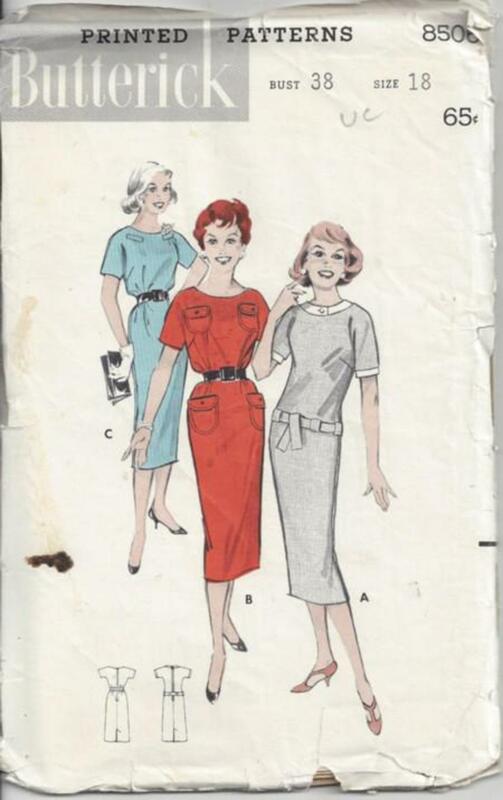 CONDITION: This Original Vintage Sewing Pattern is uncut & unused. All pieces appear to be complete and intact and have been neatly refolded with the original instructions. Envelope has worn edges.